The Nahant Education Foundation is proud to announce a unique arts program coming to the Johnson Elementary School this spring. Brooklyn-based artist Wes Sam-Bruce will visit the Johnson School from May 13-16 to install an interactive, temporary art exhibit at the school while also visiting classrooms and working on a more permanent art and play structure with the students. The program marks the launch of NEF’s new Tombolo Project, which is the arm of our foundation that focuses its fundraising and program efforts on the arts and art education. The Tombolo Project aims to unify Nahant’s student body and the community-at-large using the common love of the arts and sciences in the unique marine life and forested environment of the town, one of the world’s only natural occurring tombolos (a tombolo is a bar of sand joining an island to the mainland). Brooklyn-based artist Wes Sam-Bruce, who is six months into a year-long residency at the Peabody Essex Museum, is part of a movement to help reconnect us to the natural world, especially our local environment. His residency will culminate in a year-and-a-half long exhibition, opening on September 22, in PEM’s Dotty Brown Art & Nature Center. Jane Winchell, director of the museum’s Center, sought the artist’s collaboration with an eye to building upon the recent opening of a reimagined space in the Center, called the Pod, as part of the museum’s expansion project. “Wes Sam-Bruce’s work dovetails beautifully with our goals in the Art & Nature Center to grow people’s awareness of nature, including ourselves as beings in nature, through creative expression, imagination and ideas,” noted Winchell. Wes Sam-Bruce’s exhibition for PEM, “Where the Questions Live,” will be the outgrowth of both his personal explorations in nature and in collaboration with a range of different groups and communities, including museum visitors, schools, and arts centers for youth. His work with students has taken them on journeys of exploration of themselves, and of the world around them. 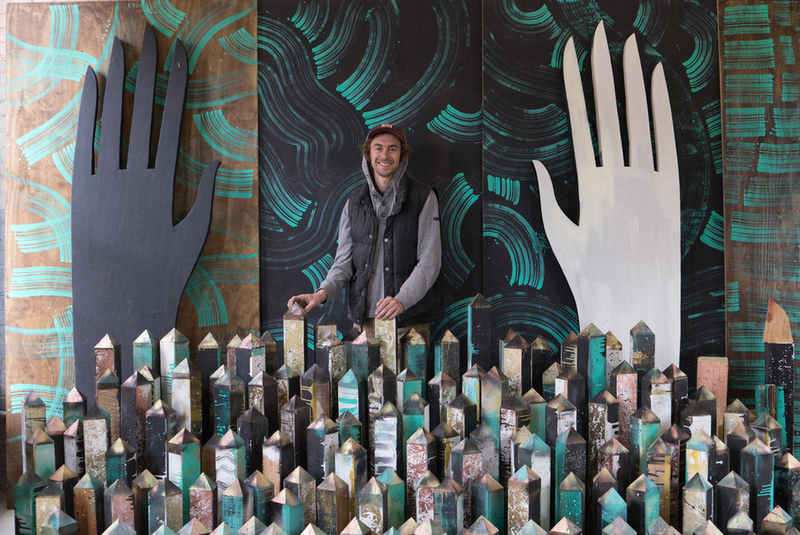 Sam-Bruce's culminating installation will be a dynamic encounter with the natural world through sculpture, painting, poetry, photography, film, music and immersive spaces that will represent his year of explorations and collaborations with various community partners and fellow artists. At the Johnson Elementary School in Nahant, Principal Kevin Andrews noticed that Wes Sam-Bruce’s work and inspiration align closely with his vision for the school. Over the past year, the school has worked with volunteers and contractors to turn a small woodlot overrun with invasive species into a “Forest Playground.” Logs will become climbing structures and benches, and a 25-foot slide will be dug into a hill. — Kevin Andrews, Principal, Johnson Elementary School. Grab one of these gorgeous long sleeved Tombolo Tees before the tide changes! Adult and Youth sizes available. We also have Tombolo Tea Towels. These Nahant originals make great gifts!